It was hailed as the greatest videogame of all time when it was released, and even after all these years it still has a pretty solid claim to that title. 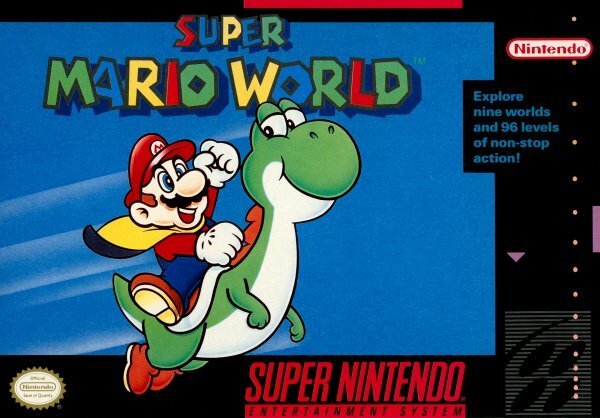 Super Mario World is without a shadow of a doubt one of our favourite Mario games, and when SNES was released some members of our staff played very little else until they'd discovered the lion's share of 96 exits. It's pretty amazing to consider that this was the first game ever released for the SNES. In terms of gameplay, Super Mario World doesn't actually deviate that greatly from the successful blueprint laid down by its predecessors. 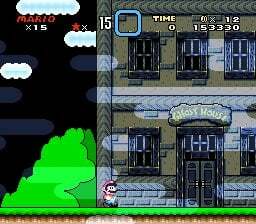 The ability to move around the massive map screen at will and revisit already conquered levels to find additional secrets is an upgraded feature from Super Mario Bros. 3, and this really adds to the replay value. Being able to save your progress helps as well — the game is so epic that it would be difficult to see everything it has to offer in one sitting. 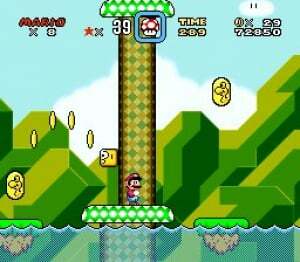 The additional special abilities that Mario is granted add an extra layer of playability, although it's a shame that the costume power-ups from Mario 3 fail to appear. However, Yoshi's introduction is probably the most well remembered innovation. The green-skinned dinosaur radically altered the way the game was played and several secret exits were only accessible when Mario was riding Yoshi. Nintendo fans often argue over which is the best game — this or Super Mario Bros. 3 — and it's likely that in 50 years time they'll still be debating the considerable merits of both games. In our opinion, however, Super Mario World comes out on top; the sheer scale of the challenge coupled with some beautiful visuals and classic music help to make this one of the greatest video games ever created. It goes without saying that this should be right at the top of your Virtual Console download list. This is the greatest 2D platformer of all time IMO, although I felt that the controls were lacking in this VC version. Either way, this game well deserves a 10/10. If not for this game and super mario bros, i would not be the gamer i am today. IMO, Much better that super mario bros 3, with much better controls, better level design, and much more play time. Super Mario Bros. 3 has the edge because SMB3 is much more challenging than Super Mario World. That being said, Super Mario World is a classic game. This is an awesome game, I just defeated the final boss today! Later on, I'll need to complete all the levels. I don't know if this is better than SMB3 or NSMBW, but it is still a classic! I remember liking the game much more when I played it on my GBA when I was like 7.... It feels weird now for some reason..
What makes Mario 3 hard are the tricky fortresses! The game is definately a classic, have very fond memories of it. Not sure whether I prefer this on SMB3, but definately one of the finest examples of the genre. Best game on the SNES, better graphics, better levels and better replayability. An absolute must-have and a steal for 800 points. Great memories with this gem. This game is one of my favorites! I have it for the Wii VC. BEST RETRO MARIO GAME EVER! Good powerups, secrets, gameplay.....overall, GREATEST MARIO GAME EVER!!!!!!!!!!!!! It's good and definitely one of the best Mario games. But it pales in comparison to Mario 3. Super Mario World is way too easy and it started a decline of Mario games having the tough as nails difficulty of the original trilogy of the NES. Yoshi's Island, Super Mario 64, Super Mario Galaxy, and Super Mario Galaxy 2 were all very easy as well. I loved the GBA remake of this game. I played it to the point of finding all the exits, collecting all the Dragon Coins, and maxing out the score counter, and STILL I played the same file! After getting the SNES VC version, the GBA didn't quite compare. One of the best Mario titles, and one of the best games I've ever played. I played this game and its a 5. just kiding. its a 9/10. Best Mario game ever i think. The graphics, the look and feel was awesome. I don't understand the massive love thrombosis people get with this game. Face it: Yoshi kind of sucked, and the only real cool power-up was the cape, although the raccoon tail looked a lot cooler from SMB3. SMB3 was more challenging, had more levels, and just seemed to feel more expansive than the supposed "world" we're given in this game. I felt like I was only getting to about the halfway mark in the game when suddenly I'm at Bowser's Castle. To me, a let-down from the glorious heights of SMB3. But whatever: this game rocks. Great graphics, good music, the haunted houses were a cool addition: but everything else was just 'been there, done that'. 7/10 or 3/5, worth your collection; but a let-down from the games on the console that Mario built, the NES. Seriously, kids. Don't try the last two. Or for that matter, the middle two (at least until you're consenting adults).